Oil on canvas, 19 7/8 x 24 1/8 in. Bellows painted The Tree in October 1918, near the end of a pleasant late summer and early autumn he spent with his family in Middletown, Rhode Island. 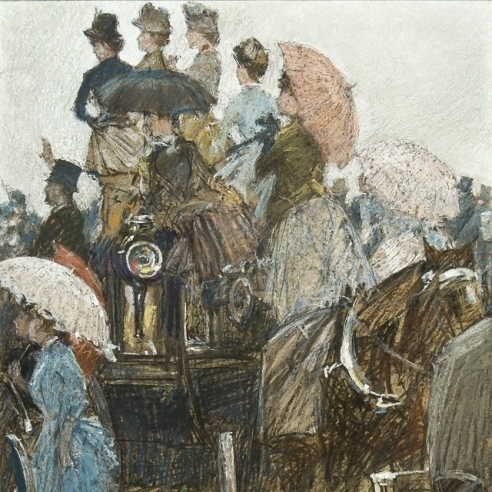 (For a biographical account of Bellow’s career, see Mary Sayre Haverstock, George Bellows .) In the midst of his work on a series of World War lithographs, certainly a dark topic, Bellows, his wife Emma, his two daughters, Anne and Jean, and the artist’s mother, Anna Smith Bellows, packed up for a few months at Rockridge Farm, a property owned by a Miss Appleton, on the coast of Narragansett Bay (Haverstock, p. 124). The change of scene inspired Bellows to produce a series of celebratory landscapes, characterized by bright colors and bucolic subjects. Middletown spans Aquidneck Island, 25 miles southeast of Providence, and about a mile from downtown Newport. The town, originally a rural neighborhood of Newport, petitioned for independence and separated from Newport in 1743. The area was the site chosen by Dean George Berkeley as his residence while he awaited funding for the college he hoped to establish in Bermuda. Berkeley lived there with his family from 1729–31, naming his modest home for a far grander location, Whitehall Castle in London. (Berkeley’s Whitehall remains and is now a museum.) The town developed as a favored site for country homes and farms and continues to be of historic interest with over 105 structures and sites identified by the Rhode Island Historical Preservation Commission. The Bellows family spent two summers in Middletown, in 1918 and 1919, a productive period for Bellows as he painted in Middletown and in the nearby Newport neighborhood, long a favorite for American artists. In addition to The Tree, Bellows painted Fisherman’s Huts, Bull and Cows, and Second Beach, Newport in 1918. In 1919, he painted Clouds and Meadows, Swamp Pastures, and Paradise Point as well as Tennis at Newport and Children on the Porch. 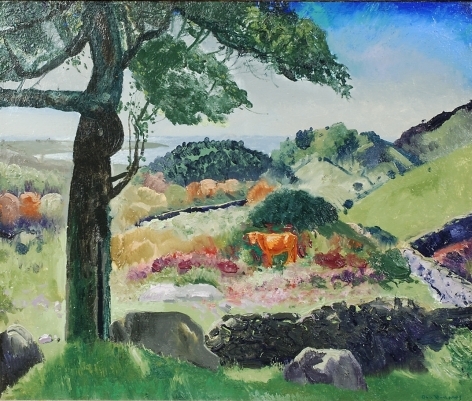 Bellows continued to paint country landscapes in the years after he left Middletown for Woodstock, New York, where he built a country house. 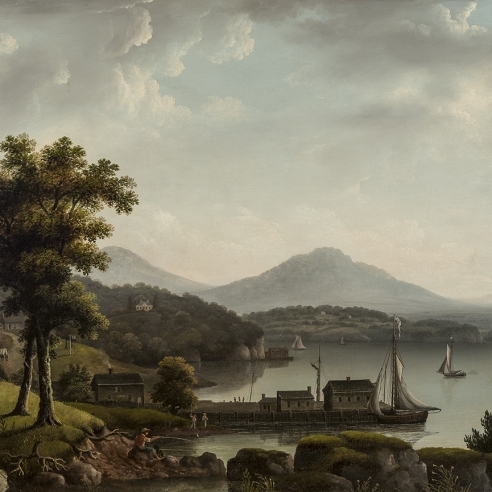 Though there is water evident on the distant horizon in The Tree, it is a minor element, a move away from the artist’s earlier preoccupation with the sea in his coastal pictures. The emphasis here is on elements of a rural landscape. 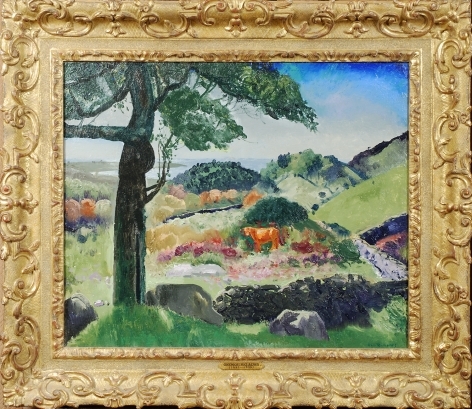 A cow serenely contemplates the viewer as it stands near the center of the canvas, sheltered in a landscape of grassy hillocks and gentle rocks. The tree that gives the canvas its name casts no appreciable shadow, but presides over a loosely painted vision of a bright day in a world untouched by the political storms that continued to occupy the artist.